A pumpkin is one of the most iconic symbols of the fall season. What would Halloween be without pumpkin carving? What would Thanksgiving be without pumpkin pie? And what would your autumn crochet be without a crochet pumpkin pattern or two? This roundup of 10 free crochet pumpkin patterns should carry you from the beginning of fall until the end, and it should keep you enjoying the season year after year. Petals to Picots offers a free crochet pattern for an adorable amigurumi pumpkin. It utilizes an interesting, but easy, yarn-wrapping technique to get the pumpkin shape. This makes it fun to create and perfect for decorating. Stack a bunch of these on top of each other on a side table at the entry of your home and you'll smile every time you walk in the house. The puff stitch is a fun stitch to practice and it provides some great texture for this pumpkin crochet beanie. It was designed by The Stitchin' Mommy. Dress baby in it throughout the autumn and see everyone smile as you both go by. This isn't just any amigurumi pattern. 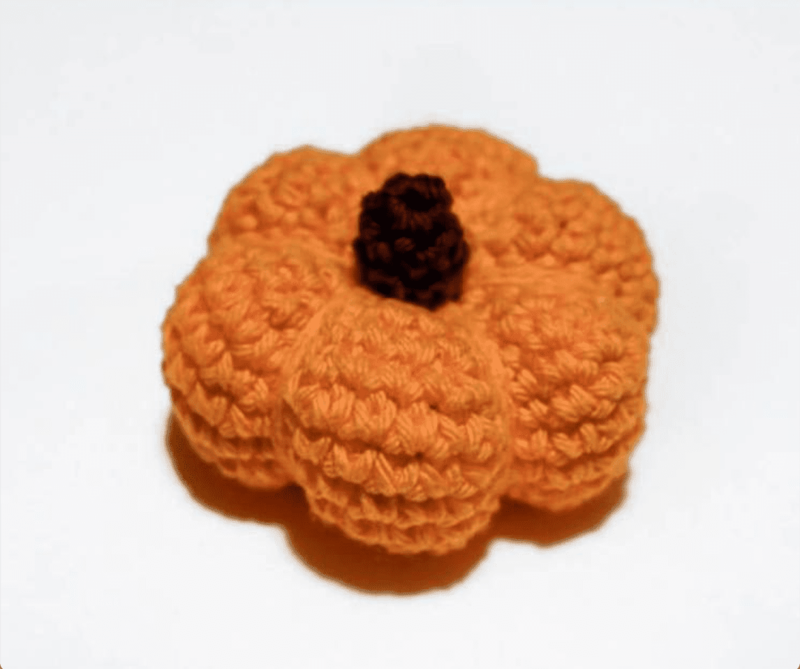 It's a Squeeze n' Sniff amigurumi pattern with a pumpkin pie-spice sachet tucked inside. What a great autumn decor project from Crafty Is Cool. It also makes a cute hostess gift for any fall parties you might get invited to or to give away as a party favor from your own fall party. Repeat Crafter Me shares this free tutorial for an autumn-themed wreath that incorporates crochet pumpkins made using her Teeny Tiny Crochet Pumpkin Pattern, which also is free. Hang it on the outside of your door to let people know how creative your home is. This free crochet pattern by Ira Rott is a popular one for fall. Any Halloween party or Thanksgiving get-together would be enhanced with these lovely coasters. The three different sizes of this free crochet pattern from Krissy's Over the Mountain Crochet make a great set that you can stack or display in a variety of ways. The set that's made using traditional autumn colors without the classic orange is striking but also shown are what they will look like in shabby chic colors, pumpkin orange, and other tones. Get creative with your crochet pumpkins—you can even use them throughout the entire year in different shades. The use of different colors makes these crochet pumpkins look unique and interesting. And yet, they are made using super-basic crochet stitches so that they are a simple beginner crochet project and one that can be worked up quickly. This is a free crochet pattern from My Merry Messy Life. Turn your jars into little crochet pumpkins for decor or gift giving. This would be perfect for a basic pumpkin pie-in-a-jar hostess gift. This free download is available through Ravelry.